She’s been called the "Godmother of Punk" and a "Punk Poet Laureate." She’s a style icon, an award-winning writer, a muse, a romantic, and a rock 'n' roll legend. Basically, Patti Smith is an all-American badass, and if she’s not one of your heroes already, it might be time to make some room on the metaphorical shelf. Or maybe you have an actual shelf or altar devoted to your idols in the corner of your room. If so, that’s cool. Make some room for Patti. Smith spent most of her childhood in Pennsylvania and New Jersey before taking off for Manhattan in the late ‘60s because what poet/muse/icon-to-be doesn’t dream of living in New York in her 20s? She met legendary artist Robert Mapplethorpe in New York, and their love affair-turned-friendship was the subject of her National Book Award-winning memoir Just Kids , which is a must read for anyone who loves poetry, romance, and the written word. It’s a truly beautiful book. Smith’s latest memoir, M Train , comes out Tuesday, and it’s a dreamy meditation on nostalgia, the creative process, and the cafes that inspire her. Smith calls the book “a roadmap to my life,” and it’s also an ode to literature, travel, memory, dreams, and coffee. When Smith accepted the National Book Award in 2010 for Just Kids, she said, “Please, no matter how we advance technologically, please don't abandon the book. There is nothing in our material world more beautiful than the book.” As if you need more reasons to start worshipping this woman, here are a few. She totally deserves a place on that altar, right next to Kim Gordon and Beyoncé and Carrie Brownstein. Like many people, Smith spent a few broke years in New York before her career started to take off. In Just Kids, she writes about gnawing on heads of lettuce for sustenance because you can’t get much cheaper than lettuce. She also survived on coffee, of course. Her trajectory has all the juicy stuff that makes biopics about struggling artists so fun to watch: hope, despair, big dreams, sad little wilted heads of lettuce. Showtime is adapting Just Kids into a series, so we’ll get to see her early, lean years on screen. Let’s hope they do her story justice and cast the right people. In M Train, Smith says that her late husband, MC5 guitarist Fred “Sonic” Smith, promised that if she “gave him a child” he would take her anywhere in the world. Now, that might sound a little messed up and patriarchal and just WTF, but they were wildly in love and Patti Smith lives her life as if she were a character in a novel, so it kind of makes sense. Anyway, she writes that, “Without hesitation I chose Saint-Laurent-du-Maroni, a border town in northwest French Guiana… I had long wished to see the remains of the French penal colony where hard-core criminals were once shipped before being transferred to Devil’s Island.” How many women (or men) would choose a dang penal colony as their dream vacation? The answer is: One. Patti Smith. Because she’s awesome. In those early days, Smith supposedly shared clothes with Robert Mapplethorpe, which helped inspire the androgynous, menswear-meets-rock-goddess look she became known for. You’ve probably seen the photos of Smith rocking men’s ties, blazers, boots and collared shirts, her black hair wild and free. She’s had imitators over the years, but the way she does it is so effortless. If you want a hero with intelligence and a keen eye for fashion, look no further than Patti Smith. Her look is the epitome of cool. Here’s something surprising: Smith belongs to the Continental Drift Club (CDC), an obscure society that was started by a Danish meteorologist. There are about 27 members from all over the world who meet in places like Iceland for their annual conference, and they’ve “pledged their dedication to the perpetuation of remembrance.” (Those are Smith’s italics from M Train, not mine. Evidently she wants us to really soak in that bit of info). She admits that she doesn’t meet the CDC’s usual criteria, but that they welcomed her “due to my abundance of romantic enthusiasm.” How cool is that? Belonging to a nerdy earth-science society that perpetuates remembrance? I’m not sure exactly what it means, but I know that it’s cool. The CDC members know it, and if you’ve listened to Smith’s music, seen her live shows, or read her books, you know that she is, like she says, a true romantic. She’s living that high school dream of sitting and having deep thoughts in cafes, writing poetry, and discussing Rimbaud and Baudelaire all day long. Only when Smith does it it’s not poser-ish or annoying. It’s just badass. Romantic and badass. Patti Smith might be like a modern-day Lord Byron, but the woman also loves that show The Killing and says that the female detective Sarah Linden in it is “dearer to me than most people. I wait for her every week, quietly fearing the day when The Killing will end and I will never see her again.” It’s fitting that she writes about The Killing in M Train and not, say, Unbreakable Kimmy Schmidt (although that would be pretty great if she did love that show too), but it’s nice to think about Patti Smith binge-watching a TV show. The fact that she fears the day she’ll never see the character again is puzzling though. 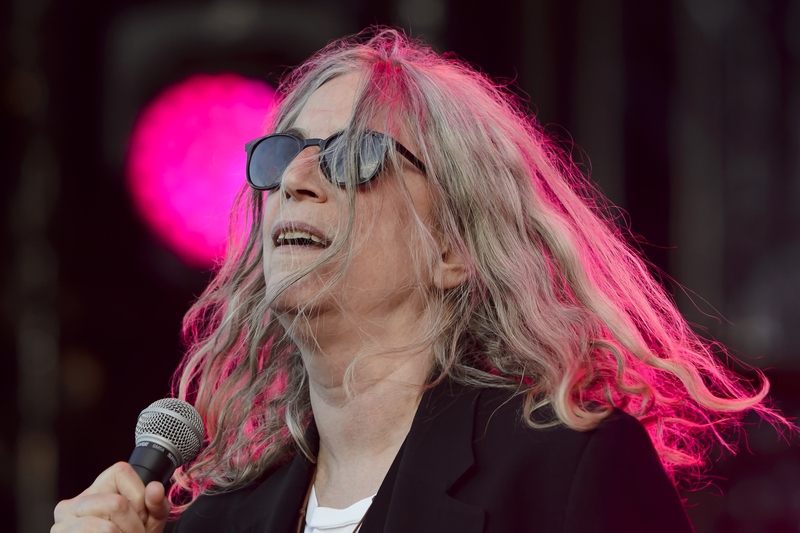 Maybe Patti Smith is too cool for Netflix. She’s a punk rock romantic, and Smith, like her writing style, is super dreamy. “The artist seeks contact with his intuitive sense of the gods, but in order to create his work, he cannot stay in this seductive and incorporeal realm,” she writes in Just Kids. “He must return to the material world in order to do his work. It's the artist's responsibility to balance mystical communication and the labor of creation.” I mean, she has mystical communications! But she’s also real. You can’t get much cooler than that. If you haven’t read Just Kids yet, run out and get it and see if you’re not erecting a real or imaginary altar to Patti Smith by the time you finish the book. And check out M Train now, too. You’ll find mystical sentences like, “I wondered if Medea climbed such rocks after her rage was satiated. I wondered who the cowpoke was.” Greek mythology and a cowpoke. Only Patti Smith could pull off that combo with such grace.